Get password? | Register Here! CouponHUGE is the ultimate website connecting businesses to their customers. 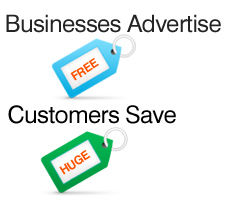 Businesses can advertise for Free. Once registered you can display your business name, logo, address, phone number, URL, description and up to 3 coupons. Customers have the opportunity to save HUGE at all their favorite area businesses. You can readily track all your favorite places to go and special offers will be just one click away. Please enjoy the site and don`t forget to tell your friends about us!